Two UFO buffs recorded the presence of an alleged fleet of "flying saucers" that remained suspended in the skies over the city of Tarma in Central Perú. The material, which appears to be unedited, shows strange lights and objects in the sky that move silently and cause excitement among the witnesses. 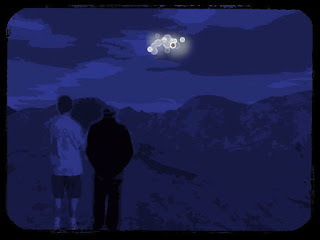 The UFO buffs claimed that the tape was recorded as from 0530 hours and that the strange phenomenon had been seen for two consecutive days in that part of the country. "Are they floating?!" asks a man with a youthful voice, identified as Edinson Avila Lamadrid. "UFOs they are!" replies the other, seemingly older one. "Look, look, look! It's a huge one!" they add. "Hey, Robert, don't go away, this is making me scared," says Edison Avila, tremorously. "This is a signal," they insist. The video shows at least six strange objects amid the darkness, forming different figures. At several moments during the recording, the shapes that appear on the recording remain still and then begin to move slowly. To prove that the recording is real and not a hoax, they videotape part of the house from where the sighting is being recorded. These same witnesses uploaded another UFO video to YouTube, recorded on June 17. This other material also shows alleged alien craft. The weather can be seen as pleasant and there are no stars in the sky. Mexico: A Solar Halo in Mexico...with UFOs?